Tomorrow (Bokra)...a song extolling a wonderful future for the Middle East submerged in justice, peace, prosperity, happiness, equality, and acceptance across all religions and beliefs. Legendary Music Producer, Quincy Jones has collaborated with Emirati social entrepreneur Badr Jafar, to jointly Executive Produce the Arabic charity single entitled 'TOMORROW / BOKRA'. The song involves 24 leading Arab Artists from 16 nations across the Middle East and North Africa singing with one voice for a better tomorrow. Grammy-nominated international superstar Akon has also lent his vocals to the track, and Shakira, who is of Lebanese descent, has recorded a special introduction to the music video. Quincy Jones' original Grammy-winning version of the song 'Tomorrow (A Better You, A Better Me)' has now been re-adapted and produced by Quincy Jones and Grammy Award-winning Moroccan producer- RedOne, with Arabic lyrics written by Majida El Roumi and musical adaptation by Kadim Al Sahir. The music video and documentary film have been directed by Malek Akkad (son of Moustapha Akkad, Director of 'The Message'). Associate Producers include Mawazine, Rabat; The Doha Film Institute; & the Qatar Museum Authority. All funds raised as part of the single's global distribution will be collected by the Arab Fund for Arts and Culture in support of the United Nations World Food Program, Dubai Culture & Arts Authority and the Abu Dhabi Music & Arts Foundation among others, to finance educational programs in music, arts and culture for children from across the Arab world. تعاون المنتج الأسطوري كوينسي جونز مع رجل الأعمال الإماراتي بدر جعفر المهتم بالمشروعات الاجتماعية لإنتاج الأغنية الخيرية العربية "بكرا"، وشارك بالغناء 24 من كبار الفنانين العرب من 16 بلداً من مختلف أنحاء الشرق الأوسط وشمال أفريقيا، والذين غنوا بصوت واحد من أجل غد أفضل. كما شارك النجم العالمي المرشح للحصول على جائزة غرامي "إيكون" في تسجيل أغنية "بكرا"، إضافة إلى المغنية المعروفة ذات الأصول اللبنانية "شاكيرا" التي سجلت كلمة متلفزة حول الأغنية الخيرية. النسخة العربية من أغنية كوينسي جونز أنتجها المنتج المغربي الفائز بجائزة غرامي "ريد ون"، وكتبت كلمات الأغنية الفنانة القديرة ماجدة الرومي وقام الفنان والملحن القدير كاظم الساهر بإعادة التوزيع الموسيقي لها. وقام المخرج مالك العقاد (نجل الراحل مصطفى العقاد مخرج فيلم "الرسالة") بإخراج الفيديو الموسيقي والفيلم الوثائقي. يتولى الصندوق العربي للثقافة والفنون (آفاق) عملية جمع التبرعات التي ستتأتى من توزيع الأغنية إلى مختلف أنحاء العالم، وستوجه المبالغ المتبرع بها إلى برنامج الغذاء العالمي التابع للأمم المتحدة وهيئة دبي للثقافة والفنون ومجموعة أبوظبي للثقافة والفنون وجهات أخرى، وذلك لتمويل البرامج التعليمية الموجهة لأطفال المنطقة العربية في مجال الموسيقى والفنون والثقافة. We filmed in nine cities with a dozen BIHE students or teachers (several whose parents were imprisoned or executed by the Islamic Republic of Iran), plus: Bani Dugal (Representative of the Baha´i International Community to the United Nations), Elise Auerbach (Iran Specialist for Amnesty International), Reginald Davis (Hard Drive Recovery Group), Hadi Ghaemi (with the International Campaign for Human Rights in Iran), Hamid Dabashi (Professor of Iranian Studies and Comparative Literature at Columbia University), and Dr. Ramin Ahmadi (Co-founder of Iran Human Rights Documentation Center). The film features footage and photos spanning two decades of BIHE classes, rare video from inside Tehran's notorious Evin Prison, and photos and a film that bring alive a series of personal stories. In the documentary, BIHE graduate Shahrzad Missaghi expresses a shared resolve, "The government can crush our bodies, but they cannot crush the mind and soul." Mojdeh Rohani, a BIHE graduate whose father was executed in 1981, says, "We can use this experience to not only just think about ourselves and what is important to us, but to look at the bigger picture; to think of people of this world as they were our own family." That is the larger, universal message of this film. 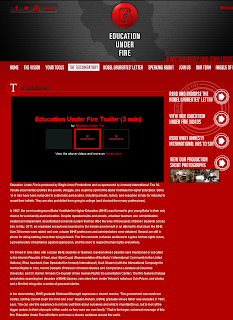 Education Under Fire will inform and move a diverse audience around the world. Iran Demonizes an Entire Community: Is History Being Repeated? 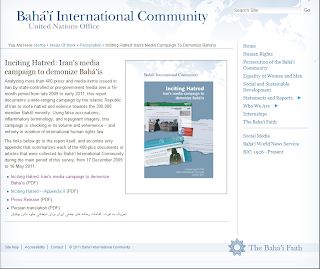 The United Nations Office of the Baha'i International Community has just issued a report titled "Inciting Hatred: Iran's media campaign to demonize Bahá'ís" which Analyzes more than 400 press and media items issued in Iran by state-controlled or pro-government media over a 16-month period from late 2009 to early 2011, this report documents a wide-ranging campaign by the Islamic Republic of Iran to incite hatred and violence towards the 300,000 member Bahá'í minority. Using false accusations, inflammatory terminology, and repugnant imagery, this campaign is shocking in its volume and vehemence – and entirely in violation of international human rights law. NEW YORK — In a wide-ranging media campaign that has gone largely unnoticed outside of Iran, hatred and discrimination are being systematically stirred up against the country's 300,000-member Baha'i minority. In a report released today, the Baha'i International Community documents and analyzes more than 400 press and media items over a 16-month period, that typify an insidious state-sponsored effort to demonize and vilify Baha'is, using false accusations, inflammatory terminology, and repugnant imagery. "This anti-Baha'i propaganda is shocking in its volume and vehemence, its scope and sophistication," said Bani Dugal, Principal Representative of the Baha'i International Community to the United Nations. "It's all cynically calculated to stir up antagonism against a peaceful religious community whose members are striving to contribute to the well-being of their society," she said. • the campaign aims to deflect attention away from calls for democracy in Iran by using Baha'is as an all-purpose "scapegoat" – and, in so doing, to smear those who oppose the government as well as human rights campaigners as Baha'is, "as if that were the most heinous crime." "The diverse content of these attacks demonstrates tremendous effort and commitment of resources by the Islamic Republic," says the report. "Many attacks are built on gross distortions of Baha'i history; some attempt a strategy of guilt by association through lumping Baha'is together with completely unrelated groups – such as 'Satanists' or the Shah's secret police; still others deploy a tactic of connecting Baha'is with 'opponents' of the regime, which allows the Government to discredit both the Baha'is and its opponents in a single transaction. The campaign makes extensive use of the World Wide Web, and often uses graphic images that portray Baha'is as fiendish ghouls or agents of Israel." Bani Dugal said the demonization of Iran's Baha'i community is a matter that deserves the attention of governments, international legal institutions, and fair-minded people everywhere. "The campaign not only clearly violates international human rights law," she said, "it also utterly contradicts Iran's long-standing claim at the UN and elsewhere that it is working to support measures to outlaw or condemn hate speech directed against religions or religious followers." "The parallels between the campaign of anti-Baha'i propaganda in Iran today and other state-sponsored, anti-religious campaigns of the past are undeniable. History shows us that such campaigns are among the foremost predictors of actual violence against religious minorities – or, in the worst case, precursors of genocide. "It is time for Iran to be told that such egregious violations of international law and norms cannot be tolerated," said Ms. Dugal. 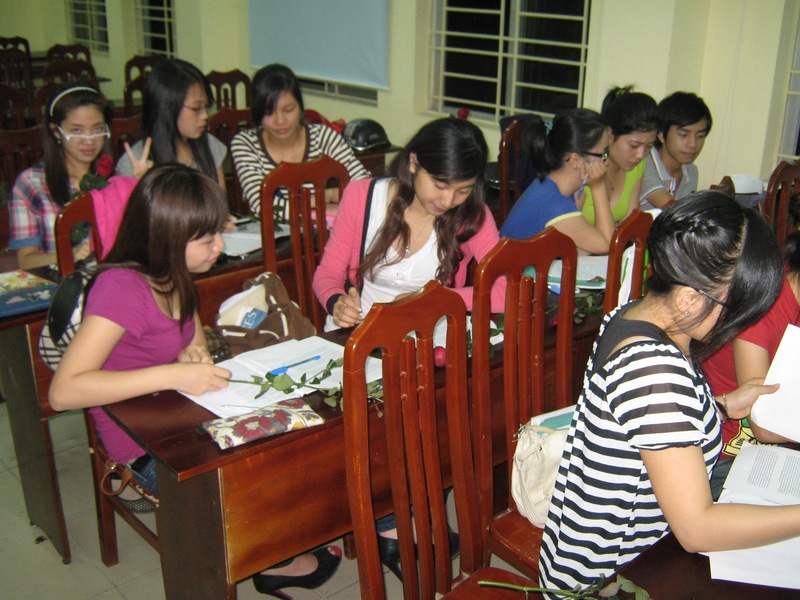 Journalism Students in Vietnam Study the "Open Letter to the People of Egypt"
A newsworthy example of the global interest in Middle East affairs, comes out of Vietnam. This piece of news was just shared with me by a professor of journalism and English, currently working in one of Vietnam's leading educational institutions. He indicated, in his communication, that the English-Translation-Editing class at the National Academy of Journalism & Communication in Vietnam is currently studying a document that was authored by the Baha'is of Egypt back in April 2011, titled "An open letter to the people of Egypt" and presented to their fellow citizens shortly after Egypt's revolution of 25 January 2011, published at this link. One would hope and expect that such an example of interest in this momentous document would be as highly valued and carefully studied by the people of Egypt for whom it was intended. A number of photographs of the class were provided, with the consent of the students, to be posted along with this brief story. While the news of mounting sectarian tensions in Egypt continue to trouble its emerging democracy as well as the world community at large, the benefits of religious unity and interfaith collaboration are felt as the G8 bloc of nations welcomed contributions from the religious summit held in conjunction with the G8 Deauville Summit. This body of religious leaders is composed of delegates from the Baha'i, Christian, Jewish, Muslim, Shinto and Sikh religions along with members of interfaith organizations. Leaders of the G20 countries, expected to meet in November 2011 in Cannes, will be also presented with the statement, drafted by the G8 Religious Leaders Summit, that was already submitted to the G8 leaders. Posted below is the story regarding these vital recommendations, which was published today by the Baha'i World News Service. BORDEAUX, France — Representatives of the Baha'i Faith have joined a call for the G8 bloc of nations to take bold action on the interconnected crises faced by humanity. Two Baha'i delegates gathered with Christian, Jewish, Muslim, Shinto and Sikh colleagues, as well as members of interfaith organisations, at the Religious Summit in Bordeaux to deliberate on matters related to the agendas of the G8 Deauville Summit and the G20 Cannes Summit, scheduled for 3-4 November 2011. Summit Moderator His Eminence Metropolitan Emmanuel Adamakis, Co-President of the Council of Churches of France, told participants that they were face-to-face not just as religious leaders but as representatives of humanity, speaking with one voice to the leaders of the G8 and G20 countries. That voice was heard in a unanimously agreed statement drafted at the meeting and later presented to the Secretary General of the G8. In addition to recommendations on five major themes – reforming global governance, the macro-economic situation, climate change, development, and investing in peace – the statement called for representatives from the African continent and the Middle East to be included in the G8 and the G20 meetings. "Our diverse backgrounds and experience enriched our consultation," the statement said. "The trauma of earthquake, tsunami and nuclear disaster described by our Japanese colleagues, the experience and aspirations of our friends from countries in the Middle East and the deep concern of our African colleagues at the continued marginalization of their voice underlined the urgency of the issues under consideration." The statement concluded by urging the G8 and G20 "to continue to expand and strengthen the needed global response to global challenges." "We – leaders of diverse religious communities throughout the world – re-commit ourselves to working together across religious lines for the common good and with governments and other partners of good will. We remain convinced – each in accordance with the teachings of their tradition – that justice, compassion and reconciliation are essential for genuine peace," the statement said. "The participants in this Summit demonstrated a sincere desire to find a way to translate the spiritual principles that inform their worldview into concrete and practical recommendations that would assist G8 leaders to address the challenges facing humanity," said Baha'i representative Susanne Tamas from Canada. "The genuine respect and keen interest with which people listened to one another and sought to deepen their understanding of complex issues was very impressive," said Ms. Tamas. Fellow Baha'i delegate Barney Leith, from the United Kingdom, agreed. "The spirit of unity that infused the gathering was deeply moving," he said. "There was a strong sense in which all those at the Summit understood themselves to be part of a single human family and to be utterly committed to reminding leaders of powerful nations of their moral commitment to reducing human suffering." 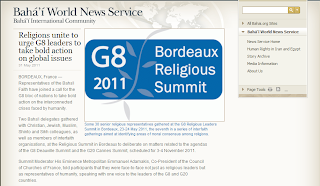 The G8 Religious Leaders Summit was held in Bordeaux on the 23-24 May. It was the seventh in a series of interfaith gatherings aimed at identifying areas of moral consensus among religions. Previous Summits were held prior to each G8 Summit in the United Kingdom (2005), Russia (2006), Germany (2007), Japan (2008), Italy (2009) and Canada (2010). The son of Bahá'u'lláh the founder of the Baha'i Faith, 'Abbas Effendi ('Abdu'l-Bahá 'Abbas), became the head of the emerging religion after the passing of Bahá'u'lláh—in accordance with His Covenant. When 'Abbas Effendi embarked on his travels in Europe and North America, he frequented Egypt between 1910 and 1913, where he was well received and hosted with respect and dignity by the generous Egyptian people during his sojourn in a number of its cities in these enlightened days of Egypt's modern history. To commemorate the 100th anniversary of 'Abbas Effendi's visits to Egypt, a book was authored and released by Professor Suheil Badi Bushrui, a distinguished author, poet, critic, translator, and media personality who is well known in the United States, the Middle East, India, Africa, and the Arab world. Presently, Bushrui was the first incumbent of CIDCM's (Center for International Development and Conflict Management) Bahá'ì Chair for World Peace at the University of Maryland, a position to which he was appointed from 1992 to 2005. He is the founder and current Director of University of Maryland's Kahlil Gibran Research and Studies Project. Well known for his seminal studies in English of the works of W.B. Yeats and for his translations of Yeats' poetry into Arabic, Bushrui is also the foremost authority on the works of Kahlil Gibran. Of note, the author's father, the late Mirza Badi Bushrui who was a resident of Alexandria, had spent much of his childhood and youth years in the home of 'Abbas Effendi in Palestine. The events of recent months have provided us, the Bahá’ís of Egypt, with an opportunity we have never experienced before: to communicate directly with you, our brothers and sisters. Though small in number, we are privileged to belong to this land wherein, for more than a hundred years, we have endeavoured to live by the principles enshrined in our Faith and striven to serve our country as upright citizens. This chance is one for which we have longed—especially because we have wished to express our thanks to those countless fair-minded, compassionate souls who supported our efforts in the last few years to obtain a measure of equality before the law. But we rejoice primarily in the fact that, at such a critical juncture in our nation’s history, we are able to make a humble contribution to the conversation which has now begun about its future and to share some perspectives, drawn from our own experience and that of Bahá’ís throughout the world, as to the prerequisites for walking the path towards lasting material and spiritual prosperity. Whatever directly motivated the rapid change that has occurred, the outcome demonstrates the collective desire of us all, the people of Egypt, to exercise greater control over our destiny. The freedom to do so is unfamiliar to us, having not previously enjoyed this degree of liberty. And our collective history, as Egyptians, Arabs, and Africans, has taught us that there is no shortage of self-interested forces in the world that would prevent us from determining our own future or, alternatively, would invite us to voluntarily abdicate this responsibility. Colonialism, religious orthodoxy, authoritarian rule, and outright tyranny have all played their part in the past. Today, the “gentler” force of consumerism and the erosion of morality which it fosters are equally capable of holding us back, under the pretence of making us more free. The fact that, as a people, we have chosen to become actively involved in determining the direction of our nation is a public sign that our society has reached a new stage in its development. A planted seed grows gradually and organically, and evolves through stages of increasing strength until it attains to a state that is recognizably “mature”; human societies share this trait too. At a certain time, dissatisfaction grows within a population at being held back from full participation in the processes that steer the course of a country, and the desire for more responsibility to be ceded to the citizens becomes overwhelming. Set in this context, the events that have taken place in Egypt can be seen as a response to forces that are, in fact, drawing the entire human race towards greater maturity and interdependence. One indication that humanity is advancing in this direction is that aspects of conduct which did not seem out of place in an earlier age—behaviours that resulted in conflict, corruption, and inequality—are increasingly seen as incompatible with the values that underpin a just society. Over time, people everywhere are becoming bolder in rejecting the attitudes and systems that prevented their progress towards maturity. The movement towards greater maturity is thus a global phenomenon. Still, it does not follow that all nations and peoples advance along the path at a uniform speed. At certain points, circumstances may converge upon a historically significant moment wherein a particular society can fundamentally re-direct its course. At such times, an expression of collective will can have a decisive and abiding effect on the future of the country. Egypt has arrived at precisely such a moment. It will not last forever. At this juncture, then, we face the weighty question of what we seek to achieve with the opportunity we have acquired. What are the choices before us? 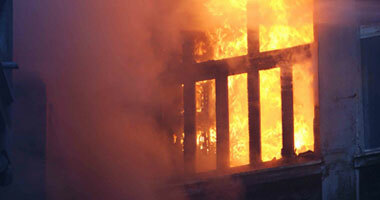 Many models of collective living are on offer and being championed by various interested parties. Are we to move towards an individualistic, fragmented society, wherein all feel liberated to pursue their own interests, even at the expense of the common good? Will we be tempted by the lures of materialism and its beholden agent, consumerism? Will we opt for a system that feeds on religious fanaticism? Are we prepared to allow an elite to emerge that will be oblivious to our collective aspirations, and may even seek to manipulate our desire for change? Or, will the process of change be allowed to lose momentum, dissolve into factional squabbling, and crumble under the weight of institutional inertia? It might justly be argued that, looking across the Arab region—and, indeed, beyond—the world wants for an unquestionably successful model of society worthy of emulation. Thus, if no existing model proves to be satisfactory, we might well consider charting a different course, and perhaps demonstrate to the community of nations that a new, truly progressive approach to the organization of society is possible. Egypt’s stature in the international order—its intellectual tradition, its history, its location—means that an enlightened choice on its part could influence the course of human development in the entire region, and impact even the world. Too often, change brought about by popular protest eventually results in disappointment. This is not because the movement that provided the catalyst for change lacks unity—indeed, its ability to foster unity among disparate peoples and interests is the essential feature that ensured its success—but rather because the realization quickly dawns that it is far easier to find common cause against the status quo than it is to agree upon what should replace it. That is why it is vital that we endeavour to achieve broad consensus on the operating principles that are to shape a new model for our society. Once agreement is reached, the policies that follow are far more likely to attract the support of the populations whom they affect. A natural temptation, when considering how our nation should progress, is to immediately seek to devise practical solutions to recognized grievances and acknowledged societal problems. But even if worthy ideas were to emerge, they would not constitute in themselves a compelling vision of how we wish our country to develop. The essential merit of principle is that, if it wins support, it induces an attitude, a dynamic, a will, an aspiration, which facilitate the discovery and implementation of practical measures. Yet a discussion of principles must be prepared to move beyond the level of abstraction. At the conceptual level, it may prove relatively easy to bring about agreement on a set of guiding principles, but without an examination of their ramifications they may amount to little more than empty slogans. An attempt to reach consensus should allow for the most searching exploration of the specific, and profound, implications that the adoption of a particular principle would carry for our nation. It is in that spirit, then, that the following principles are set out. A mature society demonstrates one feature above all others: a recognition of the oneness of humanity. How fortunate, then, that the most abiding memory of recent months is not of religious divisions or ethnic conflict, but of differences being put aside in favour of a common cause. 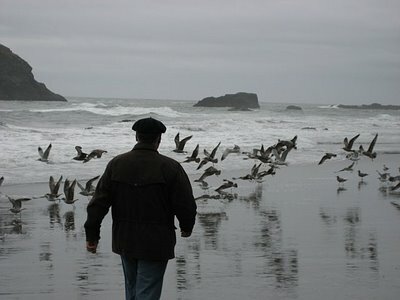 Our instinctive ability, as a people, to recognize the truth that we all belong to one human family served us well. Nevertheless, to develop institutions, agencies, and social structures that promote the oneness of humanity is an altogether greater challenge. Far from being an expression of vague and pious hope, this principle informs the nature of those essential relationships that must bind all the states and nations as members of one human family. Its genesis lies in the recognition that we were all created out of the same substance by the one Creator, and therefore, it is indefensible for one person, tribe, or nation to claim superiority over another. Its acceptance would require an organic change in the structure of present-day society, a change with far-reaching consequences for every aspect of our collective life. And beyond its societal implications, it calls for a profound re-examination of each of our own attitudes, values, and relationships with others—ultimately, for a transformation in the human heart. None of us are exempt from its exacting demands. The ramifications of this fundamental truth—the oneness of humanity—are so profound that many other vital principles, essential for the future development of Egypt, can be derived from it. A prime example is the equality of men and women. Does anything retard progress in our country more efficiently than the persistent exclusion of women from full participation in the affairs of the nation? Redressing this balance will by itself bring about improvement in every aspect of Egyptian life: religious, cultural, social, economic, and political. Like the bird that cannot fly if one wing is weaker than the other, so humanity’s ability to scale the heights of real attainment are severely impeded so long as women are denied the opportunities afforded to men. Once the same prerogatives are accorded both sexes, they will both flourish, to the benefit of all. But beyond the matter of civil rights, the principle of gender equality brings with it an attitude that must be extended to the home, to the workplace, to every social space, to the political sphere—ultimately, even to international relations. Nowhere could the equality of the sexes more helpfully be established than in education, which exists to enable men and women of every background to fulfil their innate potential to contribute to the progress of society. If it is to succeed, it must offer adequate preparation for participation in the economic life of the nation, but so, too, it must possess a robust moral dimension. Schools must impress upon their students the responsibilities inherent in being a citizen of Egypt and inculcate those values that tend toward the betterment of society and care for one’s fellow human beings. Education cannot be allowed to be the means whereby disunity and hatred of others are instilled into innocent minds. With the right approach, it can also become an effective instrument for protecting future generations from the insidious blight of corruption that so conspicuously afflicts present-day Egypt. Furthermore, access to basic education must be universal, regardless of any distinctions based on gender, ethnicity, or means. Strategies for harnessing the resources of our nation—our heritage, our agriculture, our industry—will prove fruitless if we neglect the most important resource of all: our own God-given spiritual and intellectual capacities. To prioritize improving the means by which we educate ourselves will yield an abundant harvest in the years to come. Related to the topic of education is the interaction between science and religion, twin sources of insight that humanity can draw upon as it seeks to achieve progress. It is a blessing that Egyptian society, as a whole, does not assume that the two must be in conflict, a perception sadly commonplace elsewhere. Indeed, we possess a proud history of fostering a spirit of rational and scientific enquiry—with admirable results in the areas of farming and medicine, to name but two—while retaining a strong religious tradition and respect for the values promulgated by the world’s great faiths. There is nothing in such values that should incline us toward irrational thinking or fanaticism. All of us, especially our younger generation, can be conscious that it is possible for individuals to be imbued with sincere spirituality while actively labouring for the material progress of their nation. Our nation is blessed by an abundance of youth. Some amongst us are in education; some are beginning careers or starting families; some, though older, remember what it was like to pass through those stages of life. Reform of the education system will go a long way towards ensuring that the potential of the younger generation to contribute to the life of society is realized; however, by itself, that is not sufficient. Conditions must be nurtured so that opportunities for meaningful employment multiply, talent is harnessed, and possibilities to progress are accessed on the basis of merit, not privilege. Disenchantment will grow if, because of persistent corruption, inequality, and neglect, the efforts youth make to improve the conditions of families, communities, and neighbourhoods are thwarted at every turn. The high aspirations of the young represent a trust that society as a whole—indeed, the state itself—cannot afford, either economically or morally, to ignore. This is not to say that youth are in need of special privileges. Much of the dissatisfaction that younger adults have expressed in recent months comes from an acute awareness that they lack equality of opportunity, not preferential treatment. From the conditions faced by the youth and by so many others in our society it is clear that pre-eminent among the principles that should propel the renewal we seek is justice. Its far-reaching implications are at the core of most of the issues on which we must, as a people, agree. And it is from the interplay of the two vital principles of justice and the oneness of humanity that an important truth emerges: each individual comes into the world as a trust of the whole, and the collective resources of the human race should therefore be expended for the benefit of all, not just a fraction. Neglect of this ideal has a particularly destabilizing influence on society, as extremes of wealth and poverty exacerbate existing social tensions and provoke unrest. Measures to alleviate poverty cannot ignore the existence of extreme wealth, for where there are inordinate riches accumulated by the few, the many will not escape impoverishment. Considered only in the abstract, perhaps few will dispute the essential merit of the principles discussed here. Yet, their implementation would have profound political, economic, social, and personal implications, which render them more challenging than they may appear at first. But regardless of the principles to be adopted, their capacity to imprint themselves on our emerging society will depend in large measure on the degree to which Egyptians have embraced them. For to the extent that all can be enabled to participate in the consultative processes that affect us—so that we tread the path towards becoming protagonists of our own material and spiritual development—will we avoid the risk of our society falling into the pattern of any of the existing models that see no advantage in empowering the people. The challenge before us, then, is to initiate a process of consultation about the principles that are to inform the reshaping of our society. This is a painstaking task. To fashion from divergent conceptions a coherent set of principles with the creative power to unify our population will be no small accomplishment. However, we can be confident that every sincere effort invested for this purpose will be richly rewarded by the release, from our own selves, of a fresh measure of those constructive energies on which our future depends. In such a broadly based national conversation—engaging people at all levels, in villages and in cities, in neighbourhoods and in the home, extending to the grassroots of society and drawing in every concerned citizen—it will be vital that the process not move too quickly to the pragmatic and the expedient, and not be reduced to the deals and decisions involved in the distribution of power among a new elite who would presume to become the arbiters of our future. The ongoing and wide-scale involvement of the population in such a consultative process will go a long way towards persuading the citizenry that policy-makers have the creation of a just society at heart. Given the opportunity to participate in such a process, we will be confirmed in our newly awakened consciousness that we have ownership of our own future and come to realize the collective power we already possess to transform ourselves. 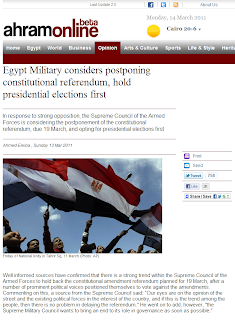 A government source, who met with the military council to discuss parliamentary and presidency elections, told Ahram Online that “the council is now leaning, though as yet undecided, towards holding the presidential election first, before parliamentary elections, and that the president would take his oath of office before the head of the supreme constitutional court." The elected president, the source said, would then invite a Constituent Assembly to formulate a new Constitution, which in turn would be put to a referendum ahead of parliamentary elections. The source went on to point out that this position came out of a meeting between the military council and the prime minister. In a poll conducted by the Egyptian cabinet's Information Support Center on Saturday, 59 per cent said they would reject the amendments. Commenting on this, the military source said that he expected more of these polls to resolve the issue finally in the next few days. Mekawy pointed out that a vote on the constitutional amendments introduced by a specially constituted committee would, in fact, prove faulty in legal terms. Such a referendum had no legal basis in the 1971 Constitution, which the military had suspended, but which would be revived in the event the amendments were approved by popular referendum, creating a legally anomalous situation. Furthermore, he pointed out, the amendments do not touch on the seeping presidential powers which the 1971 constitution grants the president, and there is no guarantee that a president elected in accordance with that constitution will want to relinquish such powers. Egypt's youth show the world their creativity, free spirit, artistic talent and innovation through their Choir Project. The words in this presentation are very telling. Through their expressed idealism and their clearly stated vision of a secular Egyptian State, governed with a policy devoid of partisanship and religious orthodoxy, they indeed give us a glimpse into Egypt's future. They close their song with the now well-known chant: "Raise Your Head High...You are an Egyptian." The bulk of the revolutionaries, including the Egyptian youth, have been angered by finding out that this Article was not also suspended. They insist that Article-2 contradicts the whole intent and purpose of the revolution. They want to ensure that the revolution does not get hijacked by religious extremism, and want to make certain that the main goal of the revolution remains unchanged, that is: "to provide for a civilian and secular State devoid of any extreme religious ideology, a State that provides equality and fairness to every Egyptian citizen without alienating any minorities or religious groups within the society." They intend to make their case clearly known this Friday. On this new day of freedom in Egypt, the shackles of inequality, injustice, corruption and repression have been removed. It is now time for peaceful transition to a society that guarantees civil and human rights and equal opportunity to all citizens regardless of their background, gender, color, race, belief, religion or any other difference in its diverse communities. It is time to feed the hungry, house the homeless, elevate the standard of living for the poor, clean up the neighborhoods, educate the children and provide work for the unemployed. Not to mention find the right kind of smoking devices. It is time to eliminate corruption, improve health care for the poor and needy, bolster the infrastructure, and raise the standard of public education for all. It is time to integrate every Egyptian into the society without leaving anyone behind. This transformation must be now realized in swift and systematic action and not merely in words and slogans. This is the will of the people. Around the clock live coverage of current events in Egypt on Al Jazeera can be seen in English at this link, and in Arabic at this link. Live Updates and Live Video on BBC (English). State -run Nile TV (Arabic). The following press release is in regards to a memorandum submitted by a forum of independent human rights organizations in Egypt to the Prime Minister, Ahmed Nazif, requesting constitutional guarantees for equality in Egypt. Yesterday the Forum for Independent Egyptian Human Rights Organizations submitted a memo to Prime Minister Ahmed Nazif asking that he form a commission under the cabinet to assume the mission of activating constitutional guarantees for citizenship, equality, and equal opportunity for all Egyptians, regardless of religion, belief, ethnicity, or place of birth. In its memo, the Forum stressed the need for the commission to include independent figures among its members to represent those segments of society that face discrimination or marginalization, such as Copts, Shiites, Baha'is, Nubians, and Sinai Bedouins, as well as representatives of human rights organizations. 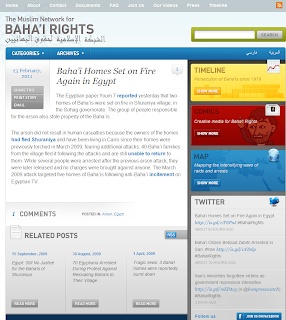 The memo, signed by 14 rights groups, aims to encourage official state efforts to address the sectarian crises that pose a real threat to the coexistence of Muslims and Copts within the framework of respect for equality, the repudiation of discrimination and exclusion, and respect for religious liberties. A clear departure must be made from the current sectarian climate, which is increasingly stoking hatred, bigotry, and religious extremism. In the memo, the Forum noted that the commission’s mandate should include drafting legal proposals to entrench equality and prevent discrimination, advising on problems resulting from discrimination, and monitoring state institution’s observance of the equal right to build and restore houses of worship and occupy senior positions in state and public institutions, including the security establishment. The commission should also assess and monitor the performance of investigating and security authorities as they deal with incidents of sectarian tension and violence and their compliance with a single standard of law in handling these cases. In addition, it will monitor and evaluate the performance of the media in confronting religious hatred, and assess and monitor the state as it undertakes a thorough review of academic curricula aimed at elevating the humanistic values common to all religions and faiths and strengthening the values of tolerance and mutual respect between adherents of different religions, faiths, and ideas. The memo stated that there must an end to arbitrary security interference in the freedom of religious belief, stressing the state’s duty to ensure protection for all individuals to worship and deal transparently with cases of conversion. All forms of harassment and pressure brought to bear on people because of their religion or belief must end. The memo added that the ability of the state to contain sectarianism and put an end to sectarian violence and tension depends to a large extent on restoring the pillars of the civil state that have been eroded over the past decades as a result of the increasing use and abuse of religion and religious institutions in politics and the public sphere. The Forum urged the state to stop deploying religion in the public and political sphere, which is better occupied in a democratic society by political parties and civil society institutions. The state must also stop using religious institutions to play political roles that go beyond their mandates. Similarly, religious institutions should produce modern religious discourses that reject religious exclusion, extremism, and hatred and promote enlightenment and moderation. The memo encouraged religious institutions to enlist one of their own qualified members to monitor publications they release or any speech for its incompatible with the values of citizenship or incites to religious hatred.